Spain somehow still seems to be a rather untouched place when it comes to underground music, and apart from Haemorrhage, I can't think of any other extreme metal band. But where this Southern holiday paradise lacks quantity, the make up with quality. 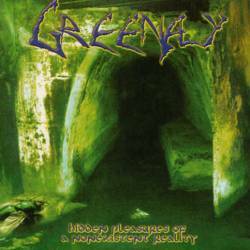 Greenfly are not your typical death metal band. In fact they neither copy the technical Florida school, nor to they follow the more melodic Swedish route. Hidden Pleasures Of A Nonexistent Reality is something entirely else, not that it's very original, but it sounds as if it comes from the heyday of the movement. The songs display a roughness unparalleled these days, the mostly melodic and speedy music is backed by bastardly rhythms. I don't know if this raw sound was wanted, or if it the result of a little budget (or even both), but the result is a charming piece of very old school death metal reminding of early Obituary, Possessed and Death, whose Born Dead is being paid tribute to in a sublime coverversion. Apart from that, if you forget about the rather nondescript intro and outro, you get a constantly high level of playing with songwriting that invited to headbang, where especially the 10-minutes long Living Beyond Suffering starts with a doom part that could have been on early Trouble and Candlemass albums. These guys really have learned their lesson, and everyone who still loves the origins of death metal should check out this charming piece of true underground.